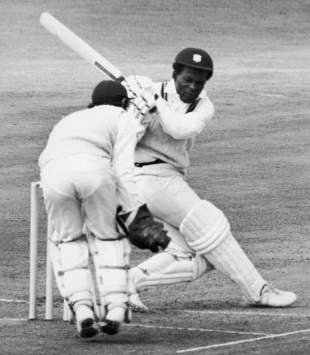 December 13, 1975 was no ordinary day of Test cricket. West Indian opener Roy Fredericks, or Freddo as he was affectionately known, peppered the boundaries of the WACA ground with a savagery and frequency that shocked Greg Chappell's Australian team. The sky was blue and the sun shone over Perth, but the fours rained in a torrent, telling all and sundry that this was an innings for the ages; a knock that would have delighted the likes of Trumper, Bradman, Harvey and Gilchrist. In just 145 balls he scorched to 169 against an attack that included Dennis Lillee at his most fearsome and Jeff Thomson at his fastest. His hundred came in 71 balls. This was not a one-dayer but a Test match, for god's sake. Freddo smashed the ball continuously, especially when he batted at the Members' End, where he hit with the strong south-easterly that blew like a mini-cyclone. His slash through backward point travelled with the velocity of a tracer bullet and was nigh on impossible to catch. There was Lillee hurling down his thunderbolts and Thomson bowling like the wind, and Freddo cutting and pulling like a man possessed. There was many a time when he cut at lifting deliveries, and at the precise instant he struck the ball, both his feet were well clear of the ground. The Fremantle Doctor added to Australia's woes, for the wind reached 50kph. Add that to the speed of Freddo's ferocious strokes. Surely the good doctor, who with his cooling hand comes to the rescue of the people of Perth every afternoon in summer, could have given Freddo a calming pill to save the poor Aussies from a terrible hiding. I was fielding in the gully and nothing came anywhere near me, yet Freddo was cutting fiercely, the ball soaring over my head and to my left, round point. We had batted first, our innings ending early on the second day for 329. Ian Chappell played a grand knock of 156 against the pace attack, led by Andy Roberts and Michael Holding. The West Indians had 90 minutes to bat before lunch. Freddo hit Lillee's second ball for six, with a hook. It was some statement of intent. A few months earlier, at Lord's in the first World Cup final, Freddo hooked Lillee's first ball for six, then trod on his stumps. This time he decided to get his eye in… for one ball. At lunch West Indies had hit 130 for the loss of Bernard Julien's wicket. Just 14 eight-ball overs had been completed: much of the time had been lost retrieving the ball from the stands and where it had rested far beyond the eastern rope. West Indies' 200 came in just 22 overs and Freddo was out for 169 (caught by Greg Chappell at second slip off Lillee) with the score at 258. In the wake of Freddo's onslaught I forgave myself for thinking that the cricket gods had conspired against the Australian team, both in a collective and individual sense. On the eve of the Test I had to visit the dentist. I'd had a tooth filled in Brisbane a week previously and thought this would be a brief visit. Alas, nothing of the sort. "The tooth has to come out," the doctor frowned. He went on to say the extraction had to be performed without anaesthetic, explaining that an abscess had developed and while the tooth needed to be pulled, the abscess would negate any "deadening" effect. As it turned out, he broke the tooth off at the gum line and the root - like some Geoff Boycott-like gremlin - had to be dug out. The trauma gave me some idea of those brave souls of yore who had a shot of whisky or a thump to the cranium prior to having their teeth pulled. How could I have known then that even greater personal pain - if not physical - was on the horizon? Getting a first-innings duck was one thing. During Fredericks' assault, I came on from the Members' End. The south-westerly had begun to increase in velocity as the afternoon wore on. Lawrence Rowe (19) departed with the score at 134, caught Rodney Marsh bowled Thomson, and Alvin Kallicharran came to the wicket. My first ball into the howling wind saw Kalli stumble forward a few yards and miss the ball. I was elated. Well, it beat the outside edge but also evaded Rod Marsh's gloves. Moral victories don't count in this game. Later Kallicharran was stuck a fearful blow from Lillee and suffered a broken nose, spending that night in a Perth hospital before returning the following day to finish with 57. Clive Lloyd was on nought when he slogged at me. The ball swirled high over mid-on, where Lillee put down the chance. Lloyd survived to hit 149. So two blokes I had nearly got before they scored managed to compile a total of 206, and my 26 wicketless overs cost me 103. Now that, friends, is real fair- dinkum pain. But all that was forgotten in the wake of Freddo's amazing innings. I had three mates who conceded more than 100 runs: Lillee got 2 for 123 off 20 overs; Thomson 3 for 128 off 17; Gary Gilmour 2 for 103 off 14; and Max Walker was let off lightly: 2 for 99 off 17. It was a thrashing of the highest order. Lindsay Hassett said on the ABC that Fredericks' 169 was the "greatest innings I've seen in Australia". Some accolade, given Hassett had played alongside Bradman from 1938 through to 1948 and seen many amazing innings from the Don and others. During World Series Cricket, Freddo, who though he was edging towards 36 and a man who seemed affronted by any suggestion to don a protective helmet, was clocked on the head by Graham McKenzie and one other. Yet he simply shook his head and batted on. Some of the Aussies dubbed him "cement head". Someone suggested Freddo called everyone "old chap", although that wasn't my experience. Whenever you bumped into the little bloke, he just seemed to mumble a greeting; then his face lit up like a Christmas tree - like his batting that day at the WACA: the day all the stars in the firmament got together with a dynamo to give the world of cricket an unmatched heavenly delight.